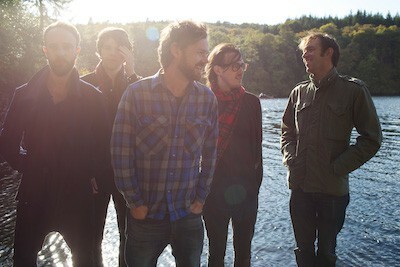 For our latest interview, we chat to Rod Jones, guitarist for Idlewild about the inspirations behind the band’s first album since 2009, ‘Everything Ever Written’. S] How are you guys today? What are you up to? S] What made you come back together for this new record – like, what experiences and feelings made you decide to bring Idlewild back to record an album? S] How do you look back on the success of tracks like ‘You Held The World In Your Arms’ now? S] What about ‘A Modern Way Of Letting Go’ – what feelings does that one conjure when you listen back now? S] What themes ideas and experiences powered the writing of ‘Everything Ever Written’? S] What keeps you guys passionate about making music now, in 2014 – think music, art, movies and such? S] How would you say that you’ve developed and changed as a musician, and as a person since Idlewild were last together, up until this point? R] “As a musician I’d say I’ve just become more comfortable and confident with my own style and exploring ways to put across my ideas. I almost feel like I can play looser and not constrained by feeling everything has to be neat and perfect. I suppose confidence allows you to feel you can leave the ‘mistakes’ or rough edges which sometime give the feel to music. Also producing music for myself and others has given me more freedom and the ability and skills to best put across my ideas without having to try and explain what I am trying to do to someone else.